Beautiful catalog printed on glossy, high quality paper - full of beautiful color photos of all dolls, outfits and accessories in the 2006/2007 Fall/Holiday Tonner-Effanbee Doll Company collection. 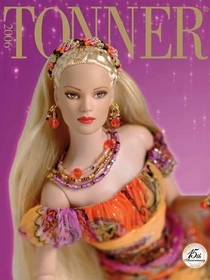 The first 36 pages of this sumptuous color catalog features all the dolls, outfits and accessories in the Tonner created Fall/Holiday season of 2006/early 2007. It highlights Tyler Wentworth; Marley Wentworth; Betsy McCall; Mary Engelbreit; The Wizard of Oz; Alice in Wonderland; Harry Potter; Memoirs of a Geisha; Cinderella; Mrs Claus & Santa's Elves; New York City Ballet and Tonner American Models. Includes some full page photos; original retail prices, edition sizes and some descriptions. Turn the catalog over and the Effanbee 2006/2007 Fall/Holiday Collection is laid out on 13 color, glossy pages representing Brenda Starr Collection; Dy-Dee Baby; Paysyette; Mrs. Willowby's First Grade Class; Toni, Katie and Wee Patsy Gift Set.